While the traditional wedding guestbook serves an important function, more and more couples — and wedding planners — are steering away from the time-tested in favor of something more personal. That’s especially true for brides and grooms having a relaxed second wedding, or those who simply enjoy a dynamic relationship and powerful personalities. 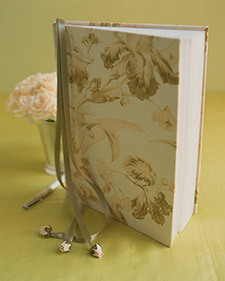 Traditional guestbooks are great, but one-of-a-kind alternatives can be even better! So, you’re sold — you’ve decided to put together a more totally-you memento of your guests than that little quilted journal and feather pen. And yet, it’s a struggle to come up with the perfect idea. Never fear … with a little brainstorming, you’ll find yourself armed with several original choices. While you ponder, ask yourself questions about what makes you stand out as a couple. What are your hobbies? Do you play any instruments? How do you like to spend your free time? What tantalizing spot did you pick for your honeymoon? Take mental note of your talents and passions … or prized possessions. Answering basic questions like these should help you develop a fresh and personal spin on the traditional guestbook. • Blessed with musical talent? If you play the guitar, keep an eye out for miniature or older, not-necessarily-playable guitars at music shops, thrift stores, and so on. Buy some Sharpies and clear acrylic spray, so the surface can be signed and sealed for years to come. You can make similar modifications to instruments like banjos, mandolins, violins. Actually, with a little creativity you could probably convert almost any instrument! • Crazy for sports? If so, consider signing memorabilia or sporting goods equipment related to your favorite sports or teams. Hockey players are sure to appreciate a signed hockey stick they can mount in a shadow box or simply hang from a wall. If you’d like to play this down a bit, just frame a picture of yourselves dressed in your favorite team’s jerseys (or going to a sporting event) and leave plenty of ink-friendly matting around the frame. • Love to travel? Look for artifacts or souvenirs that can be signed and framed or displayed after the ceremony. Fans of the Far East might enjoy a signed kimono. A safari jacket might be perfect for Africa aficionados. Most countries lend themselves to some type of apparel or indigenous piece of art that’s simple to convert into a customized guestbook alternative. • It’s also worth mentioning that the number of couples going with a Signature Platter is on the rise. Why? Because not only is a signed platter a great way to remember your special day, it’s one of the few “guestbooks” that can actually become part of your daily routine. These are hardly your only possibilities for novel alternatives to the traditional guestbook. With a little creativity, brainstorming and research, you shouldn’t have any trouble finding a “guestbook” that’s as perfect for your wedding as you are for each other. Those are some wonderful ideas for a guest book. I wish I would have known about this blog about a year ago. Great advice. we all need a art and beauty.business world do the same, right?i like yours.go on for the caracteristic world.